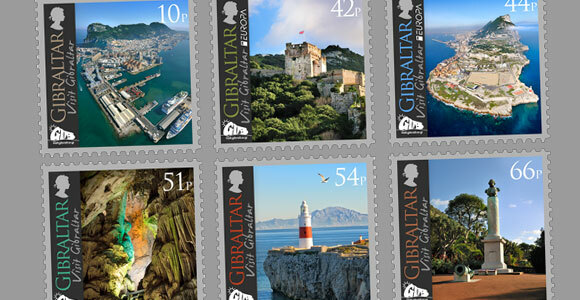 The Europa 2012 stamp issue ‘Visit Gibraltar’ showcases the iconic, world famous Rock of Gibraltar. Situated at the meeting place of the Atlantic Ocean and the Mediterranean Sea the majestic limestone Rock of Gibraltar was known in ancient times as one of the ‘Pillars of Hercules’ standing majestically across the Strait of Gibraltar alongside the southern pillar that rises in the continent of Africa. Gibraltar, looking out towards the continent of Africa. The 51p stamp features the impressive St. Michael’s Cave also located in the Upper Rock Nature Reserve. Its numerous stalactites and stalagmites continue to be formed by an accumulation of traces of dissolved rock deposited by water dripping from the ground above. The 66p stamp features Eliott’s Column located at the beautiful Alameda Botanical Gardens. George Augustus Eliott, 1st Baron Heathfield has his place sealed in Gibraltar history for his successful defence of the Gibraltar garrison and fortress during the Great Siege of Gibraltar, which lasted between 1779 and 1783 during the American War of Independence.